Posted 8/23/2013 6:25pm by Josie Hart. We would like to thank all of you for being a part of the CSA. We greatly appreciate all the feedback about how your CSA experience has been and what you would like to see in the coming weeks. August is always a rewarding yet intense month for the CSA staff. The crops really ramp up, along with the heat, which can do funny things to people. Last week, the dust, heat and hard work were well worth it as we watched shareholders leaving with smiles and three enormous bags of produce. Please read the Grower's Perspective for a field update after the massive storm we had last Thursday. Reminder: Tuesday’s distribution is at St. John’s, located at 1305 Washington St, 80206 on the west side of the cathedral near the parking lot. Please remember to pick up your melons as part of your veggie share. The fruit share: Please remember the fruit share is only for people that paid ahead of time. The bags of peaches at distribution are not for all shareholders, even if you have bread or another add-on share. As always there is a separate sign-in sheet for fruit shares and we would like everyone to sign for their bag. Melons however are for everyone! Combine vinegars, water, garlic, and ginger in a saucepan and bring to a boil. Reduce the heat to a medium low and simmer until liquid is reduced to half. Steam the beans for 2-3 minutes separately. Transfer the beans to a casserole dish and cover them with the vinegar mixture. Before serving, chill the beans for a couple hours or as long as you have until the beans are cold and refreshing. The first information I got from Michelle last night said “We are in a tropical hurricane with massive hail” and they got more dire from there: “lost all 3 tents” “… Matthew is on emergency duty figuring out the electric” … I arrived early this morning and through the darkness was reassured field 1 and the washstand still stood, though with the three tents mangled up against the side! We swept the water out of the washstand, got the onions from outside, took them inside to dry, hung up the tablecloths, and proceeded on to the check the field damage. Chard and head lettuce especially are shredded, kale shot full of holes, and the tomatoes and peppers are bruised, but the plants still stand. So, we’ll have to wait til the chard rebounds, and there may be less head lettuce and tomatoes for the next couple of weeks, but we weren’t wiped out! Thanks to all the staff and volunteers at distribution for keeping everyone safe, and preventing a potentially much worse situation with flying tents (while I simmered tomato sauce in my slippers at home, unaware of the mayhem down at the farm)! And to all, again, thanks for riding out the ups and downs of the season with us. Food Safety Note: Thoroughly wash in cold running water – no cleaning products are necessary. Sign up for September CSA Classes! Posted 8/21/2013 1:24pm by Josie Hart. These series of classes are offered to complement your CSA experience. Learn how to cook and preserve your weekly supply of vegetables and how to grow your own at home. These classes are offered at a 50% discount from DBG’s usual prices for classes – so take advantage!! Either register online and select “reciprocal member” to receive the CSA discount or call the Education registration line at 720-865-3580. Saturday, Sep.7, 9 - 11 a.m.
Come experience the vibrant beauty and flavor of one of nature's delicious, antioxidant packed foods. See how easy it is to make cool and zesty gazpacho, spicy salsa, classic caprese salad, fresh tomato sauce and more. Recipes and samples provided. Saturday, Sep. 14, 9– 11 a.m. Explore the fascinating world of wild edibles and medicinals! Many of the wild edibles collected at Chatifeld can be seen at the CSA distributions each week. Saturday, Sep. 21, 2 p.m. – 4 p.m. Sad to see your beautiful summer plants go? Save them! Take cuttings from your outdoor favorites and learn how to grow them successfully inside throughout the winter to create a beautiful indoor collection of color and texture. This class will also cover how to propagate from seed to get a jump on your spring vegetable and ornamental gardens. Saturday, Sep. 28, 2 – 4 p.m. Learn how to purchase seeds, plan and plant a garden that will provide the best opportunities for home seed saving. The class will visit our heirloom garden and with an opportunity to harvest heirloom seeds to take home. This includes collection tips specific to all the common vegetable plant families. Posted 8/19/2013 8:15pm by Josie Hart. Due to the late timing of this newsletter - we will only be giving you the produce list for this week (tomorrow and Thursday's pick up) with some additional notes from the field. Please read the newsletter next week for a full edition. * We have two remaining spaces for our Indian Curry Making Workshop and Meal in our outdoor kitchen space this Friday, August 23 - 5 p.m. to 8 p.m. Please register by emailing Josie.hart@botanicgardens.org by this Wednesday. ** Please be sure to pick up your MELONS! We have included melons in the produce list for three weeks now, yet last week we still had leftovers so please remember your melon. This is a part of your weekly VEGGIE share. *** August 27, next Tuesday, we will be at St. John's Cathedral for Tuesday's distribution. We will send out a reminder with a map later this week. small bag of baby potatoes! All the summer crops are booming now, peppers turning colors, tomatoes ripening, picking the last cantaloupe out of the field, basil chest-high. It can be hard to figure how crops move in the Colorado summer, especially with that last little rainy cloudy spell. The head lettuce sized up for this week, but for the last two weeks the eggplant have been hanging out at halfsize. We made a run through the beds two weeks ago to pick the biggies but only got about 70. So, classic CSA DILEMMA! Do we give only some people eggplant? Do we offer a choice between tomatoes OR eggplant? Do we in the tradition of Solomon give everyone a half?! We decided on giving quality eggplant instead of tiny un-ripe ones … ah, the issues which keep a CSA farmer up at night. We’re headed out tomorrow morning to make another run through the beds, hopefully we can wrangle enough for everyone! As always, thanks for sharing the ups and downs of the season with us! Posted 8/19/2013 8:09pm by Josie Hart. * We have two remaining spaces for our Indian Curry Making Workshop and Meal in our outdoor kitchen space this Friday, August 23 5 p.m. to 8 p.m. Please register by emailing Josie.hart@botanicgardens.org by this Wednesday. ** Please be sure to pick up your MELONS! We have included melons in the produce list for three weeks now, yet last week we had some still left over so please remember your melon. This is a part of your weekly VEGGIE share. *** August 27, next Tuesday, we will be at St. John's Cathedral for distribution. We will send out a reminder with a map later this week. All the summer crops are booming now, peppers turning colors, tomatoes ripening, picking the last cantaloupe out of the field, basil chest-high. It can be hard to figure how crops move in the Colorado summer, especially with that last little rainy cloudy spell. The head lettuce sized up for this week, but for the last two weeks the eggplant have been hanging out at halfsize. We made a run through the beds two weeks ago to pick the biggies but only got about 70. So, classic CSA DILEMMA! Do we give only some people eggplant? Do we offer a choice between tomatoes OR eggplant? Do we in the tradition of Solomon give everyone a half?! We decided on none … Ah, the issues which keep a CSA farmer up at night. We’re headed out tomorrow morning to make another run through the beds, hopefully we can wrangle enough for everyone! As always, thanks for sharing the ups and downs of the season with us! Posted 8/19/2013 2:04pm by Josie Hart. Posted 8/13/2013 2:35pm by Josie Hart. Please do not come to pick up your share before 4 p.m. - we moved the time up from 4:30 p.m. to accommodate the earlier crowd but we have noticed people arriving as early as 3:00 p.m. which puts more pressure on our very small staff and volunteers to get set up even sooner. Make sure you check before you pick up your fruit shares today to make sure you have purchased fruit. You will have to sign out for your two bags of peaches so please check your records first! We have added an exchange table for this week - if you can't use one of the veggie options, place it on the exchange table and that will allow others to pick up more produce if they need more or if they have bigger families. Posted 8/9/2013 6:35pm by Josie Hart. Wow! What amazing moisture we have had – truly a blessing! Today we brought in some gorgeous white onions with the help of a great organization – Silicon Valley Bank from Longmont. We all appreciate the giving hands of our volunteers and we would like to say thank you to all of our large corporate groups, individual working and non-working volunteers or any other volunteer group that has helped the CSA get through this season so far. It takes many hands to produce the food we all enjoy! Thank you. August 23rd we are hosting an Indian Cooking Night with a workshop and meal. The workshop takes place in our outdoor kitchen venue from 5 p.m. – 8p.m. and includes freshly made curry powder to take home! For more info or to reserve your seat please email: Josie.hart@botanicgardens.org *This is event is in place of an August potluck, however we will have a potluck in September! volunteers: August 12, Monday night (5:30 – 7:30) we are having a volunteer party and “meet and greet” for new volunteers in our outdoor kitchen. Please join us for cocktails, garden snacks and conversation with our wonderful CSA volunteer group. Give us your input on your experience and how working with the CSA has been. tentative: Head lettuce is on its way - we just need a little more sun to get us there so please stay tuned! weekly fruit: Two bags of beautiful peaches – yum! Hope to see all of the volunteers Monday evening and Friday the 23 of August for cooking! Have a great week! CSA pick up at St. John's Cathedral Tomorrow! Posted 8/5/2013 5:50pm by Josie Hart. There is a concert happening at York St. tomorrow so we are having the CSA distribution at St. John's Cathedral. There will be a surprise crop waiting for you - a sneak peek! If you are having a friend pick up, please let them know of the location. Posted 8/2/2013 7:10pm by Josie Hart. Welcome to the fruit edition of the newsletter! The CSA is harvesting some gorgeous melons for you this week! Please read our grower’s edition of the newsletter at the bottom for more information on our melons by our expert staff. Also we will have a produce guide at both distributions to help navigate between melon types, pepper types, beet varieties and so on. Our CSA staff also can always help you with varieties and other veggie questions during distribution. We also have the fruit schedule from Ela if you would like to know what types of fruit you will be receiving August 13 or 15 for the fruit shares only. We will have this Tuesday’s August 8 distribution at St. John’s Cathedral and not at our York St. location. This does not affect Thursday’s distribution- it is only for people who pick up on Tuesday. Please register for our CSA classes on cooking and herbs! 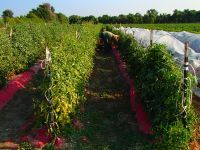 Denver Botanic Gardens is partnering with Slow Food Denver and Grow Local Colorado to offer tours of urban agriculture projects throughout the Denver metro area. We grouped the four tours being offered this summer and fall together by geographic area: Southeast, Downtown, Southwest, and Northwest. Each tour will take participants to three urban agriculture projects, with a catered local, seasonal lunch at the last stop. Aug 11, Aug 24, Sept 21, and Oct 5. Register online or by calling 720-865-3580. Oct. 29&31- 20 lb. box of storage apples. When kept cold, these apples will be delicious for weeks. 2. Chop nuts and add to the cantaloupe, honey and orange juice in a bowl. Cover and refrigerate until thoroughly chilled, a couple hours or just overnight. 3. Just before serving, briskly whisk the fruit and stir in mint. Serve very cold, garnished with sprigs of mint/basil, if desired. * Top the salad with Greek yogurt. Grower’s Perspective- Melons are Here! To me, one of the best things about being involved with a CSA is being able to get produce at the peak of its flavor. In my mind, melons are perhaps the best example of produce that, when bought from a grocery store, can never be fully appreciated for its full flavor. That’s because, a delicate fruit such as melon needs to be picked under ripe to be shipped any long distance…even within the state of Colorado. And melons off the vine won’t get any sweeter, or ripen like some other crops. For someone who gets as excited about melons as I do, picking melons at the right time becomes an incredibly important responsibility. But melons are also one of the trickiest crops to harvest. And in the gamble that is harvesting, each type of melon wears a different poker face, with different tells to determine whether each melon has reached full sweetness and maturity. This year four varieties of melon are being grown, two cantaloupes (Sarah’s Choice and Eden’s Gem), a canary melon (Brilliant) and a Crenshaw melon (Lilly). The process of finding melons to harvest requires first identifying potentially ripe melons by a color change of the outer rind, and then seeing if those melons will “slip.” The “slip” is perhaps the trickiest part of melon harvesting and occurs when the stem effortlessly falls off the melon. However, some melons such as the canary and Crenshaw are ready at a “forced slip,” when the melon has to be separated from the plant with a little more pull. While a melon ready to “slip,” like the Sarah’s Choice melons available at distribution this week, becomes pretty easy to identify after a couple tries, the forced slip is more of a guessing game and you might have to rely more on color and scent to determine if the fruit is ripe. And a good deal of tasting melons out in the field. That being said, I hope all our work tending the plants, warding off the pests and taste testing melons brings you great tasting melons that you just can’t get from the grocery store. Posted 7/26/2013 6:58pm by Josie Hart. Thanks for joining our local food community! We hope you made it out to our CSA potluck and enjoyed seeing the farm. We want to hear how your CSA experience is going: the produce quality, distribution, new ideas, recipes and suggestions. We want to hear it all! Email us at csa.chatfield@botanicgardens.org. We would like to thank all of our fantastic volunteers! The weeds are waging war on our beautiful veggies and we couldn't fight back without the help of our volunteer team. We'd also like to thank our distribution volunteers for their professionalism and resourcefulness to make each distribution a smooth process for all. Flowers: Fresh cut flower bouquets are for sale at both distributions. Please bring $5 in cash to distribution if you would like to purchase one of our gorgeous fresh bouquets arranged by our Chatfield horticulture staff. Flower types include snapdragons, straw flowers, zinnias, African daisy, celosia, salvia, sunflowers and many more. Honey: Local Chatfield honey should be ready at the end of August, however each year is different so please stay tuned for information on availability and prices from our bee keepers, Bob and Josie. Rubber bands: We have been bunching a lot of our produce to ease the time you spend in line picking out your produce, and we’d like to keep our process as sustainable as possible, so please save your CSA rubber bands and bring them back to us when convenient. Fruit shares: The fruit shares will start up mid-August, approximately August 13 and 15. Ela Farms, our fruit share supplier in Hotchkiss Colorado, is higher in elevation than Palisade and some of the other peach producing regions that were affected by the late snow, which means they have a great peach crop coming! There is nothing better in life than a juicy organic Colorado peach (well maybe the CSA basil). Some of the late season apples did get a bite from the frost so apple quantities (think Fuji storage apples) for the fall may be slightly different than last year, however Ela will supply an adequate amount of additional organic goods to compensate if that is the case. York Street distribution location changes: Please look for a separate email (where you can link to your calendars) so you know when the CSA pickup is at St. John’s Cathedral due to concerts or free days at our York Street location. community: children's picnic group at chatfield There are families meeting at the children's play area at Chatfield on Thursdays to play and picnic after picking up your CSA shares. For more information please email us at csa.chatfield@botanicgardens.org and please join if you have kiddos! weekly wild foods are going to take a break while we spend more energy on crops that take significant amounts of time to harvest like beans, squash and cucumbers. featured recipe: We have additional recipes at both distributions so please look for printed, ready to go recipes that feature at least one or more CSA weekly crop. Taken from the indispensable cookbook for CSA members, From Asparagus to Zucchini: A guide to cooking farm-fresh seasonal produce.